Zucchini is one of the most popular vegetables choices for growing in the home garden. Not only is zucchini easy to grow, it is also tasty and nutritious, as well as versatile in a number of recipes. All summer squash, including zucchini, are rich in beta-carotene, folic acid, vitamins C and E and numerous healthful minerals. Zucchini can be eaten fresh, baked into bread, roasted, grilled, added to salads and so much more. So, grow zucchini, eat up and get healthy – we’ll supply the tips you need for successful growing and a bountiful harvest. Sow zucchini seeds or seedlings about 2 weeks after the last frost date in full sun and well-drained, nutritious garden soil. 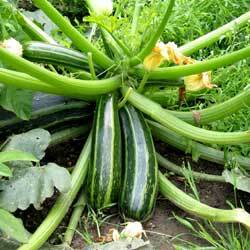 It is best to plant zucchini in hills, three plants in each, to ensure warm soil and good drainage. Hills should be about 8 inches high and 12 inches in diameter. Set hills at least three feet apart, as these plants are dense and require plenty of room for good air circulation. Zucchini plants will thrive in regular garden soil. If your soil is poor then you may wish to fertilize or amend the soil with compost. Keep zucchini plants evenly watered throughout the season. Mulch the garden bed with salt hay to keep it free of weeds and to retain soil moisture. If growing zucchini horizontally, mulch will keep the fruit clean by preventing it from coming into contact with the soil. Zucchini is a vine and may be grown vertically, with assistance, on vegetable netting or a fence, trellis or lattice. Plants and fruit are heavy, so be certain to secure the vine carefully as it grows and watch for any signs of breakage that could damage maturing vegetables. Zucchini is best and has the best flavor if it is harvested when young and tender, about 6 inches long. Use pruning shears or a garden knife to cut zucchini from the vine. Never pull the fruit off, which can damage the vine as well as the vegetable. A number of pests will like zucchini just as much as you do, but there are steps you can take to keep your zucchini patch pest-free. Cucumber Beetle: These insects will skeletonize the zucchini leaves, resulting in lower yields and smaller vegetables. Plant resistant varieties and hand pick the beetles. Squash Bugs: Yellow spotting on zucchini leaves that turn brown identifies squash bug damage. Eventually the leaves then turn black and crispy. Control this pest when plants are young. Look for eggs on the underside of zucchini leaves and crush them. Squash Vine Borer: This pest first presents itself with wilting leaves. Upon inspection you will see orange ‘sawdust’ at the base of the plant. Use floating row covers if planting early or hold off on planting zucchini until after July 4th when the insect egg laying is completed. 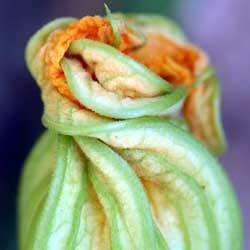 Blossom End Rot: This disease appears as a dark, leathery patch on the blossom end of the zucchini. It is caused by either uneven soil moisture or a soil calcium deficiency. Do not allow soil to dry out between watering, and add calcium to the soil with dolomitic lime or gypsum to ensure proper nutrition. Try these delicious treats to make the most of your zucchini harvest! Slice zucchini into 1/4 inch thick slices (peel first if desired). Toss in a bowl with Italian dressing. Place on a hot grill about 4 to 5 minutes or until nice grill marks appear and the zucchini is slightly limp. Serve and enjoy. Grease and flour two 8 x 4 inch bread pans. Sift flour, salt, baking powder, soda and cinnamon together in a bowl. Beat eggs, oil, vanilla and sugar together in a large bowl. Add sifted ingredients to the creamed mixture and beat well. Stir in zucchini and nuts (if desired) until well combined. Bake for 40-60 minutes or until tester inserted in the center comes out clean. Remove bread from pan, and cool completely.